Custom Made Acrylic Box With White Base 21"x21"x18"
Custom Made Acrylic Box With White Base 21"Wx21"Dx18"H - 3/16" Thick Polished edges. Exterior (Outside Dimension) Open on 24"x24" Side. Tough acrylic panels with high-quality, flat glossy base, stackable design. 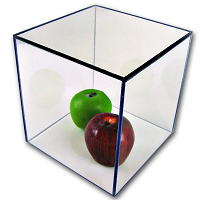 1 Clear Display Case with white base included. Custom Made Acrylic Display Case with white base.